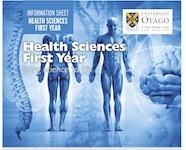 Are you thinking about studying the Health Sciences at the University of Otago? Health Sciences First Year (HSFY) is the foundation year for the five professional programmes: dentistry, medical laboratory science, medicine, pharmacy, and physiotherapy. It is also great preparation for students seeking admission to the restricted-entry degree programmes in Oral Health, Dental Technology, or Medical Radiation Therapy. PHSI 191 (Biological Physics) is a core part of the Health Sciences First Year programme (HSFY), and is one of the compulsory papers taken in the first semester. Find out more at our PHSI 191 homepage. The Health Sciences First Year must be your first year of university study. If you are considering any tertiary study before enrolling in the course, you are advised to contact the Health Sciences Admissions Office. Find out more about the Health Sciences First Year. If you feel like your educational background in physics may not have prepared you for HSFY, you can get prepared with JumpSTART Physics.